Start now saving on your money with this latest week softmoc flyer, specials, offers, deals, promotions, sales and coupons. View the current softmoc flyer to save on all products offerted by softmoc ! Find all the deals & specials for softmoc in the current flyer below. SoftMoc is your choice for comfortable quality footwear. Our relationships with the best footwear manufacturers in the world allows you, the discriminating corporate buyer to provide your employees and clients with top quality footwear. Our small Canadian privately owned company began with our first store in the Toronto Eaton Centre. Since then we have grown to more than 90 stores across Canada with locations in NewFoundLand, New Brunswick, Nova Scotia, Prince Edward Island, Ontario, Saskatchewan, Manitoba, Alberta, and British Columbia. We sell the most well known brands on trend for men, women and kids including: Converse, Clarks, Merrell, Fyre,Birkenstock, Ecco, Dr. Martens, SoftMoc and Josef Seibel, to name just a few. Check out this website to learn more about SoftMoc, a canadian success story. You can buy your shoes with confidence from SoftMoc.com. SoftMoc is a truly Canadian owned company. SoftMoc.com has been operating since 1996! 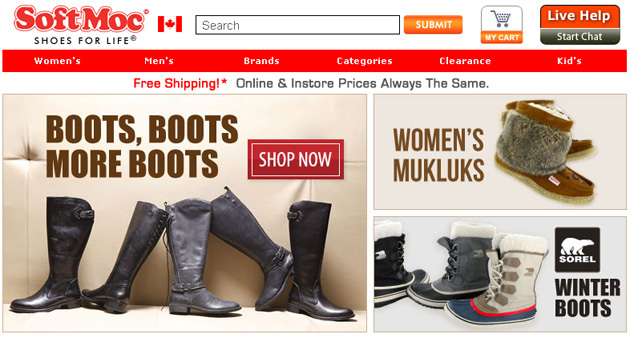 We offer customers in Canada the best brand named men’s shoes, women’s shoes, and kid’s shoes at unbeatable prices. All orders come with a 75-day money-back guarantee with service you can trust. You can buy your shoes with confidence from SoftMoc.com. SoftMoc is a truly Canadian owned company. SoftMoc.com has been operating since 1996! We offer customers in Canada the best brand named men’s shoes, women’s shoes, and kid’s shoes at unbeatable prices. All orders come with a money-back guarantee with service you can trust.